A simple layered outfit for a cool summer’s day: floral chinos, ombre knitwear and a crisp white shirt layered underneath. I actually bought this white shirt many months ago, but as it has 3/4 length sleeves I don’t think I’ve worn it yet (being chilly isn’t something I cope with too well). It’s a great basic and I’ll be pairing it with a full midi skirt and some sort of neck tie next, so watch this space. I also love the mix of textures and patterns in this outfit. Summer is a great time to pile on the bracelets, get out the florals and rediscover those light summer knits you put away over the winter months. Both my ombre sweater and sequinned hobo bag are years old but I still love them both – with my new flat pointed mules and pretty gold drop ball earrings it feels like a whole new outfit. Are you enjoying lots of patterns and textures now that summer is here? Let me know what you’re pairing in the comments! P.S. Did you see yesterday’s post – a video of me playing the bongos…! I love ow you paired that bag with the knit of the sweater. Very complementary. And the earrings are drop dead gorgeous. Pun intended. Hehe don't hold your breath, Monika – I'm not giving up the bag just yet!! ;))) Thank you sweetie – it's warming up in the UK very, very slowly… we'll get there! These layers are so soft and effortless. I love the patterned pants! Love it! I remember these pants, and of course I love them. 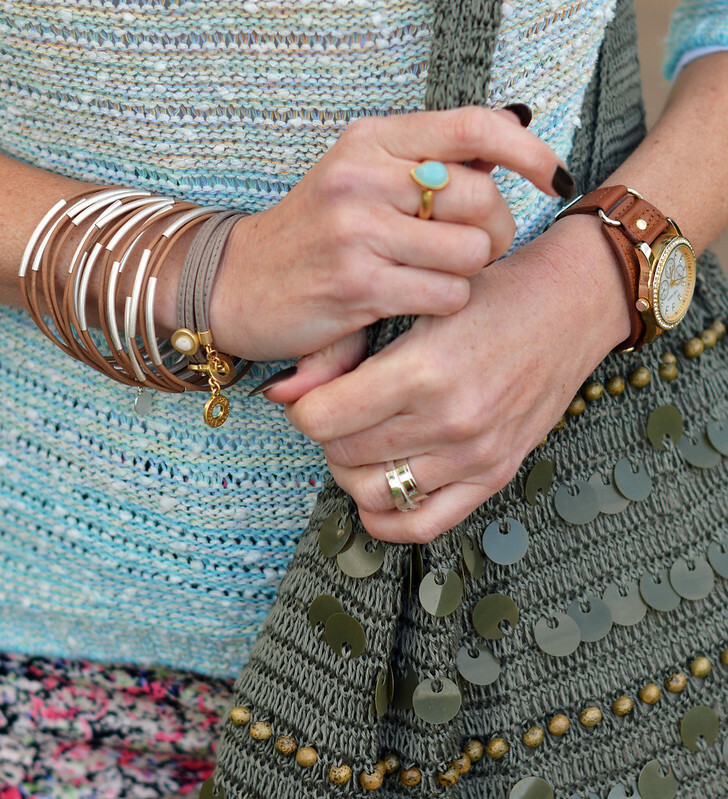 The crochet bag is such a lovely olive color, it looks like a great neutral. Love it tip to toe! Would love to see you at the TH Tuesday link up when you can this week! Looks great Catherine. Love the turquoise ring. Makes me remember that I'm currently on the hunt for a white summer blouse. One that's a bit soft..and not quite as stiff and starchy as my Theory cotton shirt that I wear in the fall and winter. Thanks for the reminder. That sweater is so pretty and I am drooling over the stunning bracelets! Thank you so much lovely Alice!! So chic! Love those earrings. And you always look gorgeous, Catherine. Ah completely in love with those trousers! Thanks Sophie – one of those items I was so glad to rediscover when I dug out my summer wardrobe…!